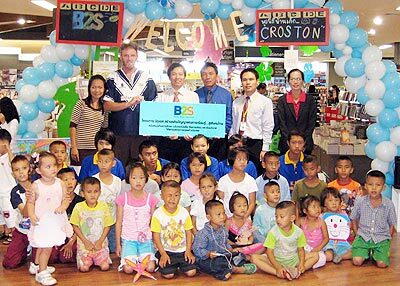 Rosjana and Glen Croston (left rear) receive the donation at B2S Robinson Chiang Mai. B2S’s northern area manager, Bandarn Kavinsungkom, with the managers of Robinsons Kad Suan Kaew and Changklan branches, pictured donating books and cash to the value of 30,000 baht to Rodjana and Glenn Croston from Croston House Children’s Home. The presentation was made at B2S Robinsons, under the B2S Smart Brain for Studying project aimed at helping develop children’s skills and knowledge. The Scorpio boys assemble for a group photo at the Home for Boys. 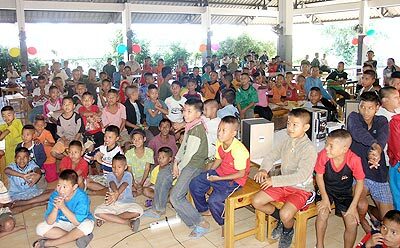 A great idea by Tim McGuire and a group of his friends is proving an amazing success with the kids at the Home for Boys on the Mae Rim Road, next to the Vienping Orphanage. Tim’s plan is to hold a party every month for kids whose birthday falls within that month. ‘Cake in your Face’ was a great laugh. Some of the boys have no idea when they were born, so they are simply allocated a month and get their party as well. 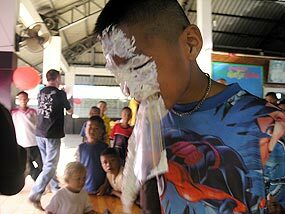 On average, each month’s party will be a celebration of around 20 kids’ birthdays and of course, every boy gets to join in the fun whether it’s his birthday or not. On Sunday, November 16, the ‘Scorpio boys’ had their party - with ice cream, cake, juice and other goodies for all. And of course the birthday boys each got a birthday present as well. A fun packed afternoon was had by all, which included games such as musical chairs and bobbing for apples, and (one of the most popular…) cake in your face. 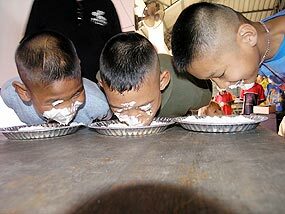 This last involved three pie dishes filled with whipped cream, with the contestants having to remove a prize from the bottom of the dish – but using only their mouths. Tim arranged everything, including a magician, ‘The Upward Spiral’ aka Nick Wiszynski, who mesmerised the kids with his tricks. Of course, there were fireworks, and a film, Dr. Suess Horton hears a Who!, with the screen, projector and speakers kindly provided by John and Lois Richard. Methanee kept the entire event rolling along (as smoothly as is possible with an attendance of 120 boys) with her Thai/ English language skills. This was the first of the monthly parties, and a great success. If anyone would like to help by giving a few hours of their time on a Sunday, or in any other way, please do contact Tim on [email protected] The next party will be on December 14 - just in time for Christmas! Happy Birthday to you (all). Watching the magician kept all the boys quiet (for a change).